I love holidays, and I love baking for holidays. 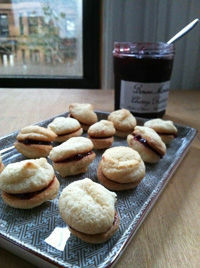 Valentine’s Day being no exception, I started out with a little cherry-filled macaroon sandwich cookie. They’re pretty sweet, hardly health food, but a small batch means they don’t linger. The texture is a bit sticky/chewy, which I adore, and I made them into tiny little buttons, each filled with a dot of deep red cherry jam—call them confections, rather than cookies. I doubt we’ll be pouring on the candle-lit, violin-playing romance for Valentines Day this year, since, well, we’re busy. But in all the busy-ness, I love my guys more than ever. Aaron, busy working on his opera when he’s not working full-time or hanging out with us, and Leo, busy building robots out of bristle blocks—robots who live in tinker toy houses. There’s a lot of love in our little household.